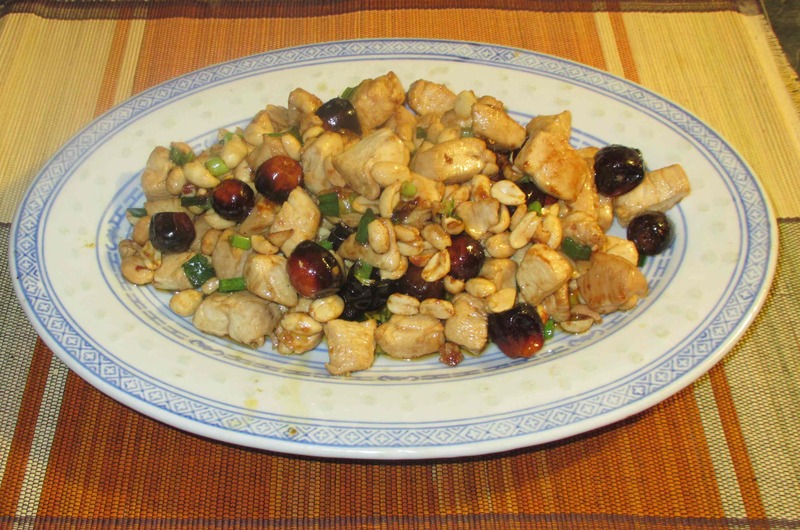 The great classic of Sichuan cuisine most commonly known as ‘Kung Pao Chicken’ is one that will be familiar to many people nowadays as it has become almost ubiquitous on Chinese restaurant menus both within China and around the world. In English, the variations on the name are almost legion and include (but are far from limited to) ‘Gongbo’, ‘Kung Pow’, ‘Kun Po’, and the highly memorable, if slightly unappetizing ‘Koon Poo’, which I actually came upon at restaurant in eastern Canada many years ago. 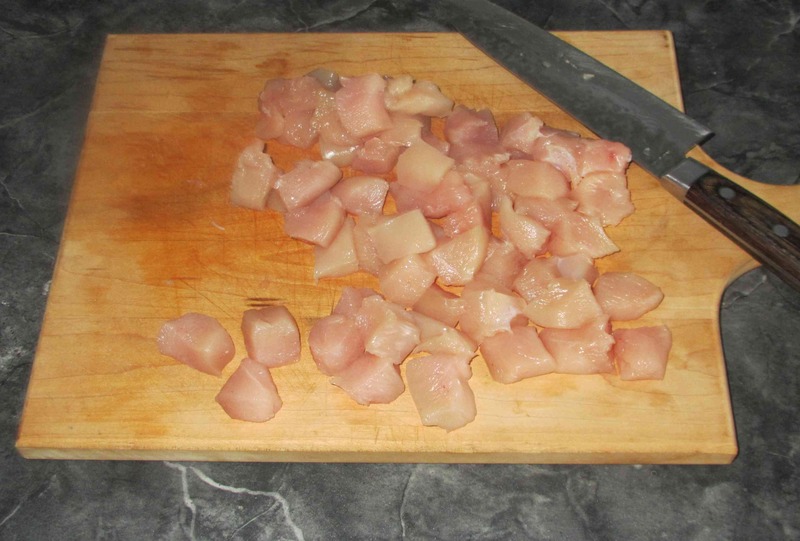 First, slice your chicken meat into cubes about the size of a large gaming dice (about 1.5 cm across). At this point, the cubes are generally marinated briefly and then cornstarch, and sometimes egg white, is added before the cubes are fried in hot oil. Here, however, we will adopt my technique of simply blanching the chicken. This is a significant departure from the usual process but I find that it yields a nice, clean result. Heat a pot of light salted water over a medium flame until just below the boiling point. 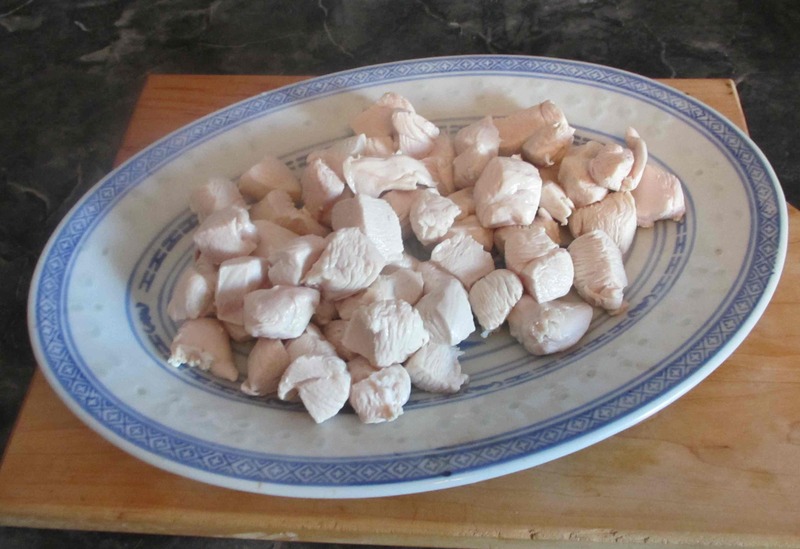 Add the chicken cubes, stirring to make sure they separate, and blanche them just until their surfaces turn white. As soon as this happens, drain them into a colander and rinse well under cold water to cool the pieces and flush away in ‘bits’. Set the pieces aside for the time being. 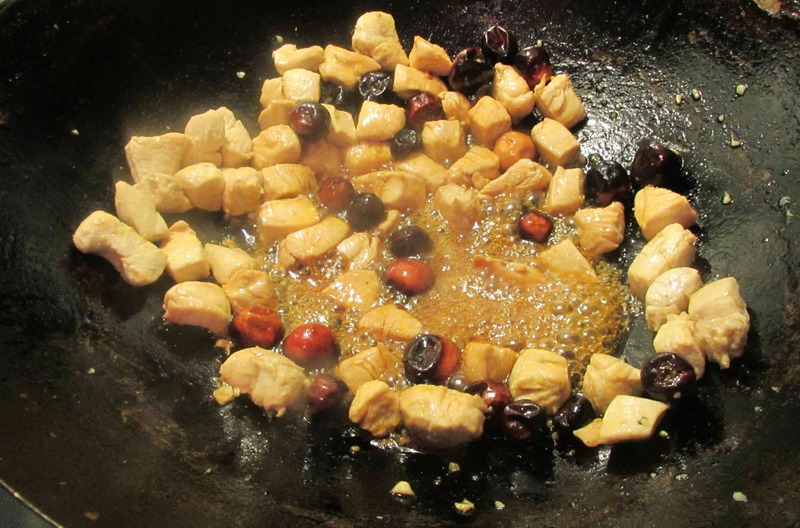 When you are ready to cook, heat your wok over a moderately hot flame and add about 4 tablespoons of cooking oil. When the oil begins to shimmer, add your chilies and stir until the give up their fragrance to the oil and turn a nice dark color. Be careful here and don’t let them turn completely black or else the dish will be bitter. Add the garlic and as soon as you smell the aroma, throw in the chicken and stir until the cubes get a little golden brown in places. Now add in sugar, the vinegar, and the soy sauce and stir until the sugar melts and the sauce is glossy and thickened slightly. 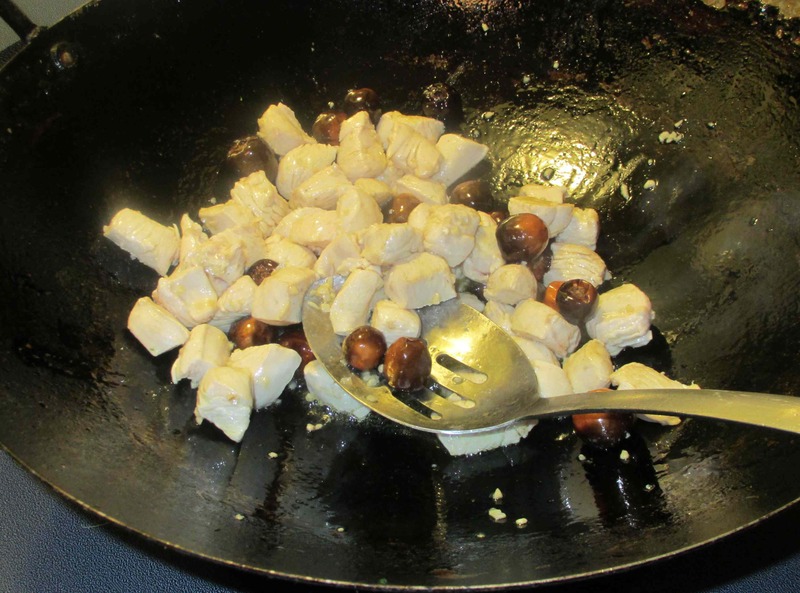 Add in the scallion, the peanuts and the Sichuan Pepper Oil and continue to cook for a few minutes longer until the chicken is cooked through. Finally, stir in the Sesame Oil, if using, and plate for service. First, there could have been a bit more fire to the dish; the chilies I used are an Indian variety and not terribly hot… next time I will use something a bit more fiery. Secondly, my wok, I discovered, doesn’t sit low enough to the heat on this new flat top ceramic stove I have. Accordingly the chicken steam-cooked in its own juices rather than sear on the outside. One of the nice features of the blanching method is that, if you later fry the cubes at a high enough temperature, they get a nice crispness on the outside and remain very soft and tender in the middle. On this occasion, the steam cooking altered the texture negatively. Aside from that, the experiment was generally successful. The scorched chili flavor was just right and the sweet and sour taste was apparent but did not dominate. The Sichuan Pepper Oil was a bit less ‘numbing’ than I usually expect but it lent a lovely, citrusy note to the overall flavor. I like using Sichuan Pepper Oil but you can substitute a quarter cup or so of the whole peppercorns if you like, either adding them before the chili and fishing them out after they flavor the oil, or leaving them in. Personally, I dislike them in the finished dish as they add a gritty quality to the texture. This version was quite similar to today’s experiment, but if you look closely, you may be able to see that I used Sichuan Peppercorns rather than the oil. 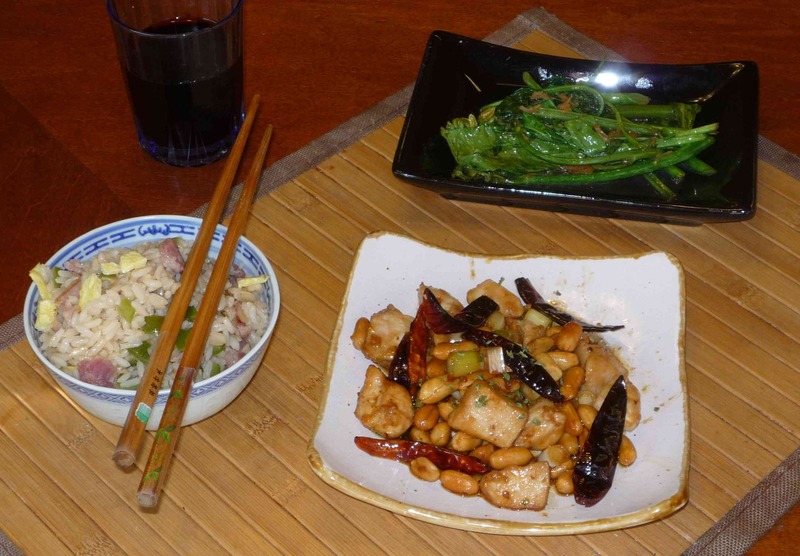 This one, served with Gai Lan and fried rice, was made with long chilies and was quite fiery. My bf and I eat a meal cooked in our wok at least once a week. It’s one of those things that’s fast enough to cook up after a long weekday. I think we’ll be adding this to our repertoire of recipes. It’ll switch things up! Also, I’m in the North East and like to shop for the week’s vegetables at our local farmers market. Do you have a suggestion of chiles/peppers to use in the dish that I could find locally here? 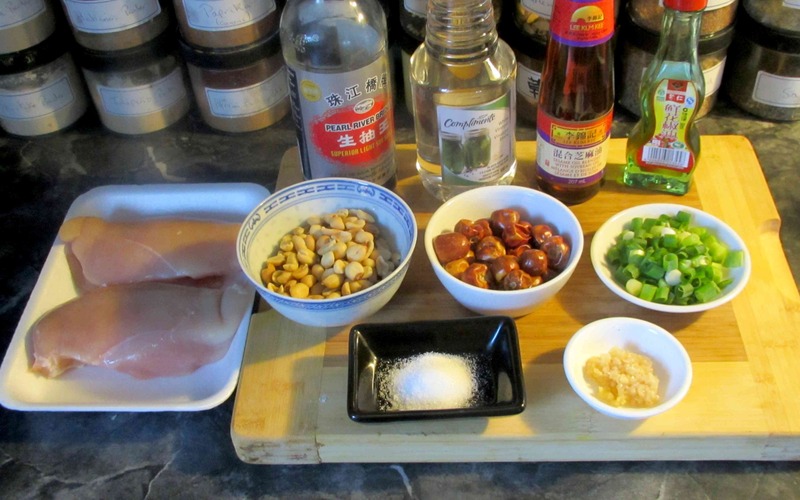 I guess I don’t really have an Asian cuisine side to my blog so, here y’are! One of my favorite dishes. There is a Vietnamese food store here in town that sells tiny dried peppers that are beyond mean. I don’t know what they are called but I make my own chili oil. I use the dried chilis but add these little monsters to the oil for some heat. I am going to try the different type of chilis you used as the picture of these is very interesting. But I will add a dollop of my own oil for a bit more of a bite. thank you. 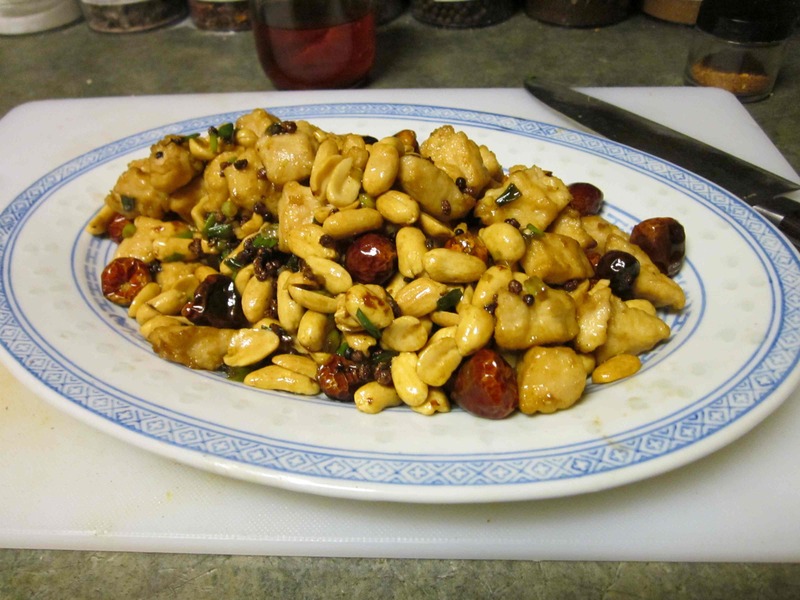 I love Kung Pao Chicken and only have eaten it out. This looks delicious. I was thinking of how good it looked in your wok and was surprised to learn through your post that you have the wrong type for a flat top ceramic stove. Good to know! I just need to get a wider ‘ring’ for the wok to sit in so it is closer to the heat. It looks very delicious. 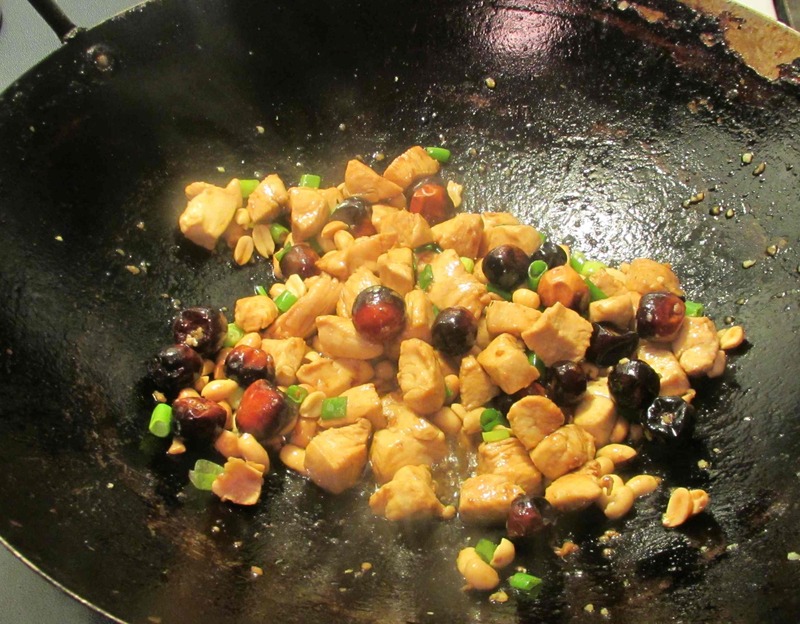 There are also woks which have flat base. Otherwise, you can buy a “ring” where your wok can sit on. Probably you can get one in Toronto. I actually still have the original ring. 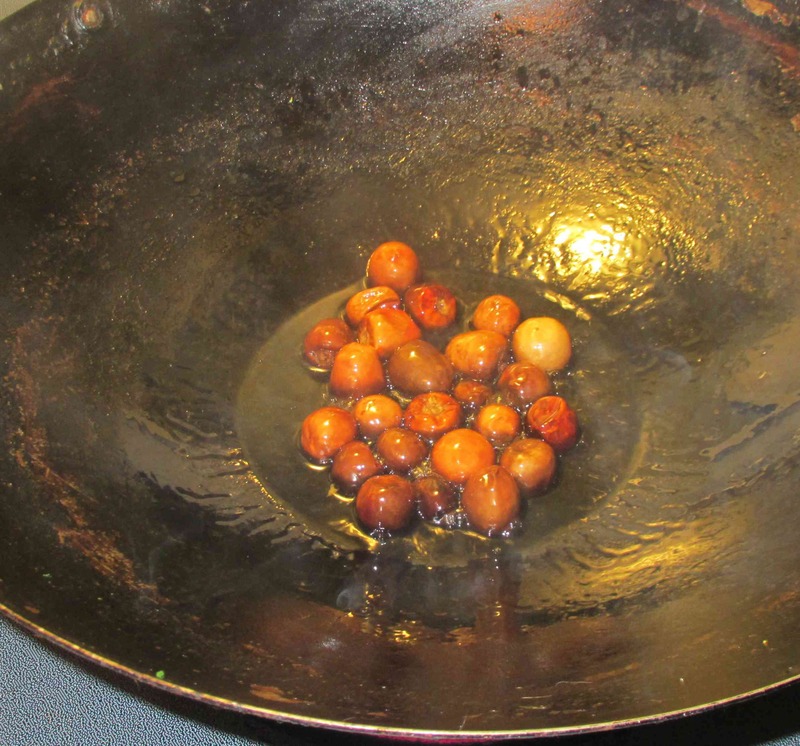 I always sat my wok with the ring inverted so the base was closer to the heat. The ring was wider than the electric element so the element ‘protruded’ through and was only a half centimeter from the wok base… now my wok sits about 2cm from the heat 😦 I’ve been using the wok for about thirty years now and want to keep it… I can probably modify the ring maybe. wow! I don’t know that a wok can last that long….! 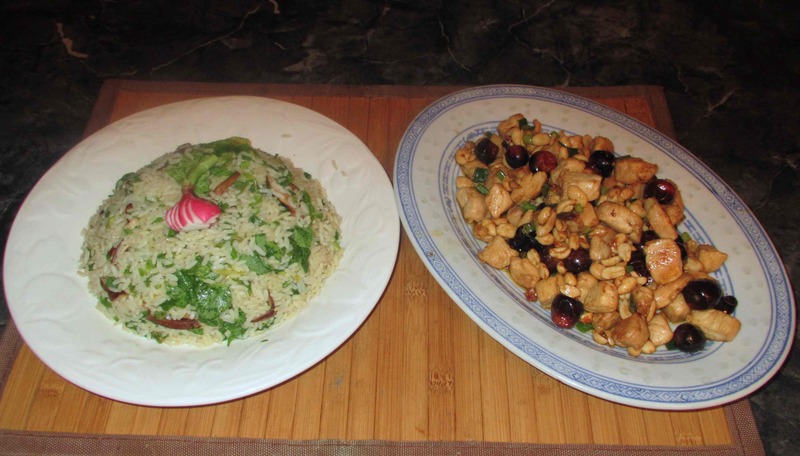 Here’s another dish for me to try! I don’t know these round chillies though? I’m afraid I don’t know a great deak about them. I have two sorts that look much the same. One was a product of India… the other Pakistan (I think). The packages didn’t say much else. They are not overly hot. My mum grows small long oval types in her garden in London. They are black when ripe and ridiculously hot. I haven’t seen round ones in Cambodia. Were yours dried or fresh? Dried … that’s traditional. Long thin chilies cut into sections is also more traditional… I just had the round ones and I like them.